Hi there, it's Christmas card creation time! 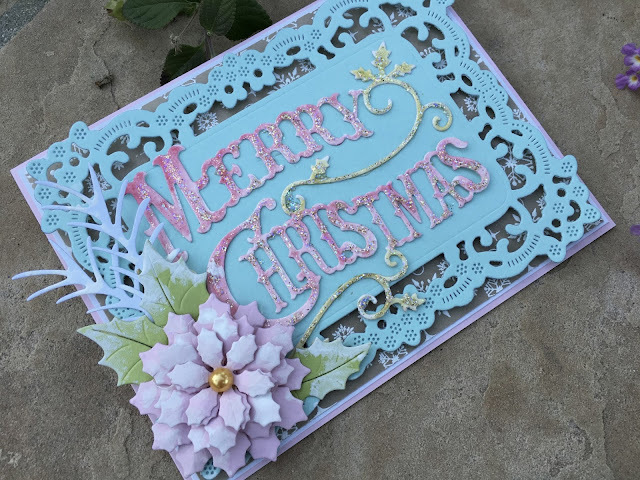 So I am here today with a Christmas card and since this week's challenge is to use non-traditional colors, that's how I created my card and I quite like it a lot! 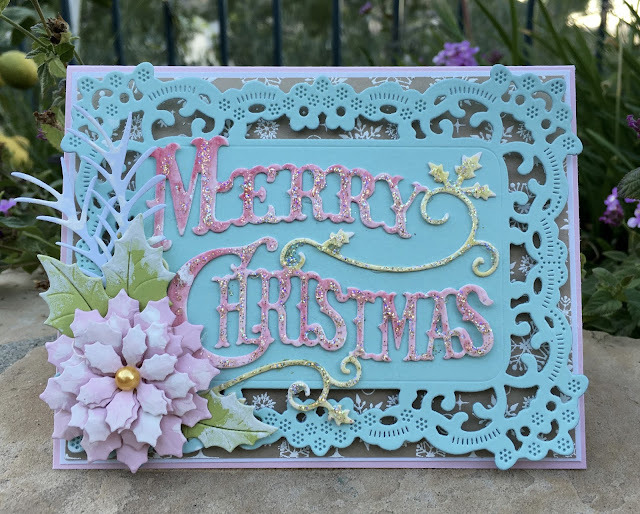 To start off, I cut an A2 size card base out of light pink card stock, than I cut a slightly smaller card base out of white card stock, than another slightly smaller card stock out of kraft color and white embossed snowflakes on it using a stamp. Next I die cut a Fiona's Magic Mirror out of light blue card stock. Than I die cut a Merry Christmas out of white watercolor card stock and painted it with pink and green colors. Adhered it to the middle of my mirror die shape and added some glitter to it. Next I die cut my flower using Poinsettia Strip out of light pink card stock, built my flower and edged it with a little gesso and gold half pearl in the middle. I also die cut a strip of Holly Leaves and added the leaves around my flower and finally I die cut the Pine Branches out of white card stock and left it just like that. Thank you for visiting us today and hope to see your challenge cards uploaded this week again!